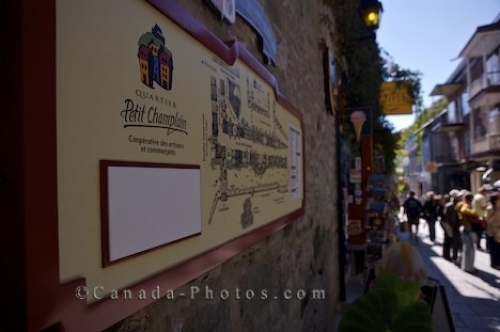 A sign aids tourists in their adventure around the historic Quartier Petite Champlain in Old Quebec in Quebec, Canada. Signs are located everywhere in the historic region of Quartier Petite Champlain in Old Quebec City, Canada making it easy for tourists to find their way around. This sign outlines the Quartier Petite Champlain and the different streets where many tourists flock to each summer. On this beautiful summer day, the Rue du Petite Champlain in Old Quebec, Canada is filled with people browsing the shops. Sign along Rue du Petite Champlain, Quartier Petite Champlain, Old Quebec, Quebec City, Quebec, Canada. UNESCO World Heritage Site. Picture of a sign for tourists to view in the historic area of Quartier Petite Champlain in Old Quebec in Quebec, Canada.